I had the honor to be the Magdalene and John's wedding photographer, who married at Artipelag in the Stockholm archipelago. They had a lovely weather with wedding on top of the roof of the art gallery Artipelag, overlooking the sea in Stockholm archipelago. The artist Martin Stenmarck came as a surprise up on the roof and sang for the wedding couple! 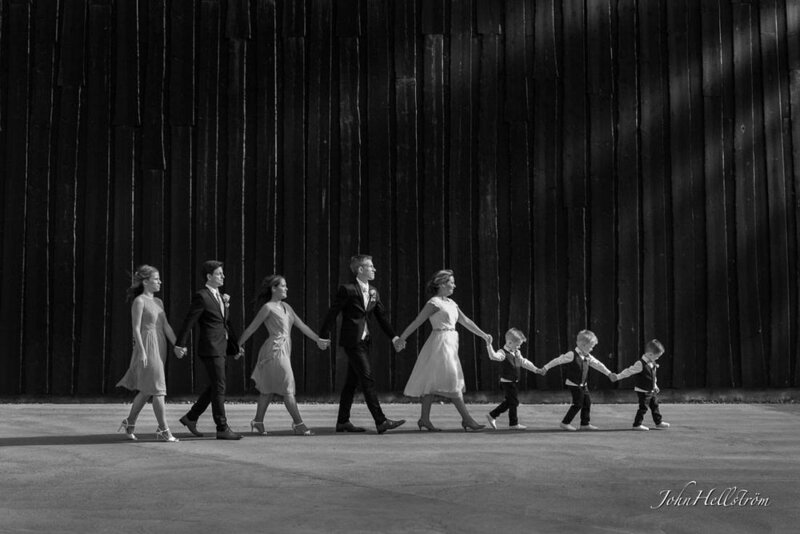 Above is a picture when the bridal couple with their bridesmaids, groomsman and children walked to the wedding ceremony that was on the roof of Artipelag. The artist Martin Stenmarck came as a surprise and sang a song! Artipelag describe themselves: "The name ‘Artipelag’ is a combination of Art, Activities and Archipelago. It says a lot about what we can offer, but it does not tell it all. Our intention has been to create a destination of high international quality – with boundary-crossing art exhibits, inspiring activities and great food. There is ample space here – about 32,000 square feet – for a large art hall and a shop with our own custom-designed products. The site also boasts our Artbox, an enormous concert, event and studio locale of 13,000 square feet with accompanying artists’ space. There are also activity spaces for children and youngsters, conference rooms of varying sizes and two restaurants – both with outdoor serving and magnificent sea views." Q: How did you meet= A: On a party with common friends. Q: How did you decide to get married? S: Johan asked winter 2013, and it was natural as we have two children together. Q: What did you like about the venue? S: We searched for a venue in a wonderful environment with the nature close. Q: Where did these things/support/vendors come from? Q: Any wedding travel? S: Some wonderful days at the French riviera. We are married now, darling!